I have been a fiber artist since 1975. Using and adapting well-practiced basket-making skills, shaping vessels that contain and share space has always been a joy for me. I create textured and colorful vessels, in forms that are woven, stitched, layered, and constructed as distinctive individuals. Each vessel can stand alone, or can be connected and related with other pieces in support and unity, often representing a community of women with stories to share. 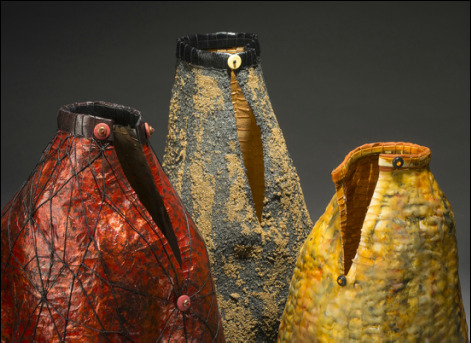 I collaborate with each piece as it develops, working intuitively, allowing a dialogue to emerge, with the colors and textures of the materials informing the vessels as I create them. My materials include archival and recycled papers, sand, acrylic paint, silk and cotton fabrics, wire, recycled plastic bags, encaustic wax, thread, buttons, stones, and more. As an educator, my craft development workshops with women in Africa have had a profound influence on my art and on my life. I have learned to simplify, to let the forms and the materials speak for themselves. The fabrics, the colors, the earth, and the people continue to impact the vessels I create, yielding richness and diversity.